At the end of last week I went to see my boss, John Manzoni to tell him I’m leaving government. I wanted to take a moment here to thank everyone for the tremendous help I’ve been given in the last five years. There’s been kindness and encouragement from outside government too, our early conversations with Tim O’Reilly and Jen Pahlka in the US have blossomed into shared practices and mutual support with the USDS and 18F. Governments across the world have acknowledged the pioneering work we’ve been doing and have decided to join us on the journey. Our Digital Advisory Board has listened, advised and nudged us forward. The wider government technology/digital/open data community has been a fantastic critical friend, holding us to account and helping us improve. And, as we always say - The Unit of Delivery is the Team. 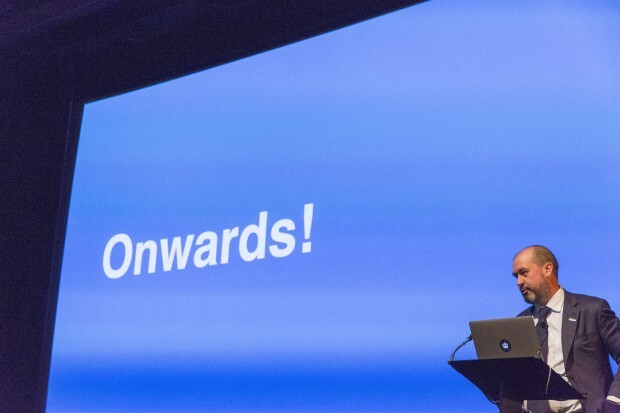 Leadership is a total privilege, one can only lead with the consent and support of a team and I’ll say right here and now that the team at GDS is the best digital delivery group in the world. It has been an honour and a pleasure to work with them all, whether they are here now or spent just a short period with us in the last 5 years. They are dedicated, determined, talented and funny. I will miss them more than I can possibly explain. Government doesn’t know how lucky it is. Which means I’m leaving government’s digital delivery in capable hands – especially with the support we are getting for the future of digital transformation from the new Minister for the Cabinet Office, Matt Hancock. The GDS leadership is strong, our plans are clear and focused, our people - and digital teams across government - are rolling up their sleeves to continue the work of transformation. One particular pleasure has been seeing new leaders emerging, and I can confidently say within GDS and departments we have many inspiring digital leaders from a range of disciplines, and many of them are women. I wish them every continuing success. And, finally, of course, I have to thank our users. Whenever this job has been difficult it’s been remembering people like Ann, applying for her Lasting Power of Attorney, that’s kept me going. On the many occasions when this job has been an absolute pleasure it’s normally been because someone’s just shown me a digital product that will make some user’s life a little easier. I’ll write more about where I am going - and the future I see for digital generally - on my own blog at mikebracken.com. Though I don't know you personally, I was deeply impressed by Michael Brunton-Spall's excellent presentation to PyConUK last year. The presentation illustrates the department's work through a remarkably agile and efficient, user-led project to create a new web service to help people working for companies facing insolvency. If this level of effectiveness and openness is the result of your work, taxpayers like me will miss you. I hope your replacement is no less inspired. I want to thank you for all the hard work you have put in over the past 5 years. GDS has always been an easy target for those resistant to change however I find it hard to believe that your passion and integrity can ever be questioned. It falls to those who remain to keep Whitehall in check and ensure that the bad habits don’t start to creep back in. Mike, your energy and drive do make you a tough act to follow. Thanks very much for the leadership that you have provided. However, I do agree with JA above that, without a similar guiding light, there is now a risk to the future. The transformation is nascent, and there is a way to go before it is fully embedded across central government. Resistance, mostly borne out of simple misunderstanding, abounds and the need remains for a clear steer from the centre. A wholesale re-design of government IT is our aim, and I can see this being achieved incrementally in parallel with learning lessons along the way, in good agile style, as long as we have the right leadership. While I am sure you will say that there are plenty of very well qualified and energetic people to provide the figurehead, the risk remains as it does with any change of this sort. I look forward to understanding what the future leadership looks like. I have to start by saying that I admire the way that you managed to create focus on the importance of computing in Government and build the momentum behind GDS. My fear for you was always when you moved from digital publishing (gov.uk), which was where you made your name, to transactional systems. They are completely different disciplines and with the exemplars what has been delivered is merely "lipstick on the pig", there is no transformation, and the same is true for the other exemplars. In order to maximise the benefit of today's global computing network a fundamental redesign of public service computing is necessary. I do not believe the failure to evaluate such radical alternatives lies at you door. The fact there is no pan-Government body to evaluate such alternatives lies outside your remit. But, if we are to prevent the return of the oligopoly, you may wish to raise this deficiency before your departure. It is essential that a pan-Government design authority is put in place. Thanks for several years of courageous and inspiring work. You can't tackle smugness, complacency and extravagance on the scale it had grown to across Whitehall without tweaking a few whiskers. Let's hope you've done enough, and best of luck to those who take this work forward. Even looking in from a bit of a distance the energy and commitment you sustained over 5 years has looked amazing. More importantly, it made a difference. A big one. Wishing you all the best.